View or download the complete Colorado Daily Status Report for November 25, 2014. View or download the complete Colorado Daily Status Report for November 24, 2014. DHSEM welcomes Jerry Eastman as our new Cyber-Security Intelligence Analyst beginning today, November 24. Eastman was formally the Colorado South Central All-Hazards Region Analyst and brings a great depth of understanding of cyber intelligence from the emergency management perspective as well as the technical education to support the analytical process. He earned his Bachelor's degree from Embry-Riddle Aeronautical University in Business Administration and also attended Northwest Missouri State and Regis University for his post-graduate work. Eastman has 21 years of Service in the United States Air Force. We are very excited to have him onboard with DHSEM. 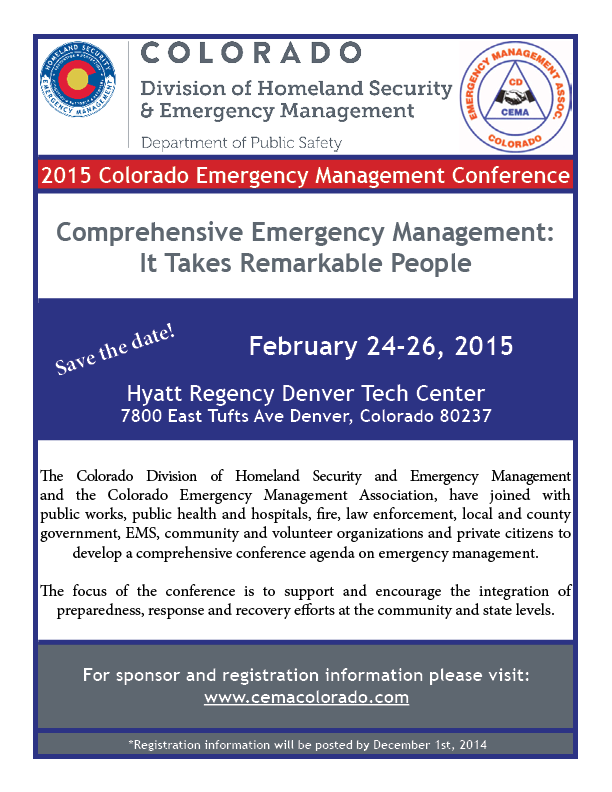 He will work with Jory Maes, Colorado Infrastructure Protection Program Manager. View or download the complete Colorado Daily Status Report for November 14, 2014. Information provided by Grand Mesa, Uncompahgre & Gunnison National Forests Public Affairs Officer. The Grand Mesa, Uncompahgre and Gunnison National Forests will burn approximately 500 “slash piles” at the Raspberry Radio Repeater site today, located approximately 20 miles southwest of Montrose on the Uncompahgre Plateau. The piles are the result of chainsaw thinning that was performed at the site to help protect numerous radio antennas and other structures from potential fire damage, should wildland fire occur in the area. Specifically, a burn plan has been prepared and approved and specifies staffing, weather and other conditions that are required to light the piles. The plan also calls for conditions that are wet enough to prevent fire from creeping along the ground and/or when snow is present. Likewise, smoke dispersal conditions of “Fair” or better are required in order to minimize visual impacts in the area. Forest fire management officials have determined that sufficient conditions exist on the site to be within prescribed parameters today. Updates may be posted on their website www.fs.usda.gov/gmug or their Twitter account at www.Twitter.com/GMUG_NG or @GMUG_NG. View or download the complete Colorado Daily Status Report for November 06, 2014.